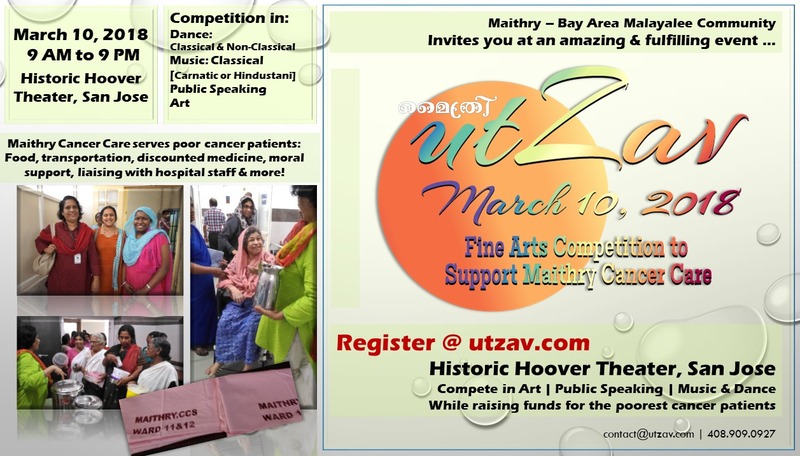 Maithry Utzav 2018 - Fine Arts Competition to Support Maithry Cancer Care. Thanks to all who had registered! Registration for all categories are now closed! Please read Maithry Utzav 2018 Guidelines (https://tinyurl.com/yd4z3t4w) before submitting your registration(s). For any questions, please send us an email to contact@utzav.com. All viewers (except the participants) of the program need to purchase a ticket for entry into the auditorium. Please make sure to complete all fields, select the appropriate ticket type and scroll to the bottom and 'SUBMIT'. You will receive an email confirmation upon successful submission of your registration. Disclaimer: All purchases are final. Tickets are non-refundable and non-transferable. You must show copy of confirmation email at check-in, at least 30 minutes before seating time. Maithry reserves the right to alter date, schedule and location of event. Please visit www.maithry.org for more details.